The Kindle app simply received an incredible makeover. Amazon on Tuesday unveiled a total overhaul of the app, which enables reading ebooks and magazines on any machine — including iPhones, iPads, Android phones, and even PCs. Probably the greatest change to the app is its new streamlined look. It has a cleaner, more straightforward-to-use design and two distinctive color themes — easy and darkish. Amazon also added its Goodreads social community into the iOS app, which lets clients join with people who share the same style in books. Amazon bought Goodreads in 2013. The new app has one catch, you cannot buy books or magazines at once through the Kindle App on iOS devices. You will need to buy it during the Amazon website and send it to your iPhone or iPad. The Kindle app is free to download on the Apple App Store, Google Play, and for Macs and PCs. Good article. It’s always good to see products improve and change over time. That said, just aesthetic changes can make the visual experience more appealing but not necessarily the functional side of it. 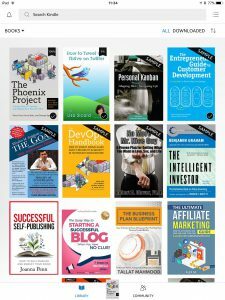 In your opinion, what are some ways that kindle could improve from here? In terms of how well it handles the ebooks, anyway. I think that the Kindle app -as well as the Kindle eReader- has evolved a lot in the past few years. I like Whispersync, the integration with Goodreads and the plethora of books (even free) available. Now, I think that organising books and lists could be easier. I’d like to be able to select on the device/app multiple books and then add them to a list (just like the website) and not the other way around. I would also like PDF, Word and other docs to be automatically converted to Kindle format when using the Send to Kindle. PDF is not easy to read on a 6″ screen. Many zoom-ins/outs and scrolling is required. I think that Kindle format is thew platform’s strength and Amazon should embrace it more. your post was very elaborative , and very simple..
kindle is surely a great ereader.. it feel great while reading on it..
Glad you liked it. Will do my best.